After a long flight and a five hour stop over in Hong Kong we finally arrived in Bali at 2.30am. We were lucky to be able to stay in the sister hotel to the one we were supposed to be staying at, as it was closer to the airport. 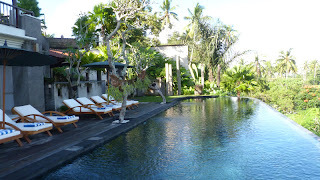 The next day we were driven to Alam Ubud, our hotel, which was beautiful. 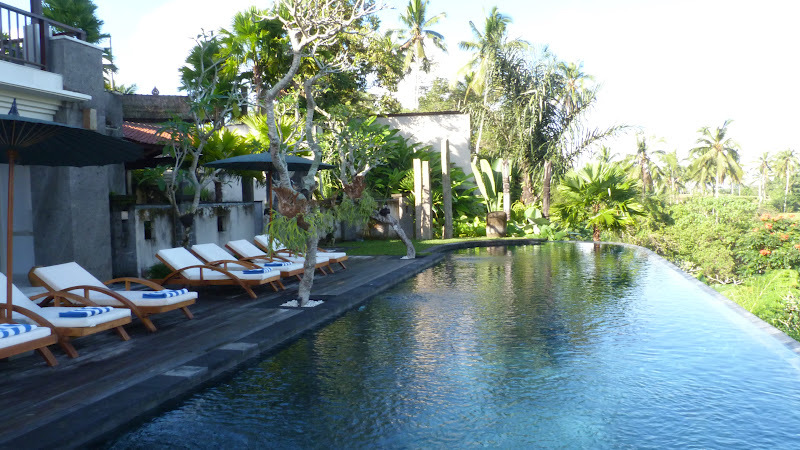 It was in the middle of nowhere, (about 15 mins drive from Ubud) surrounded by palm trees, jungle and paddy fields and was just what we wanted. 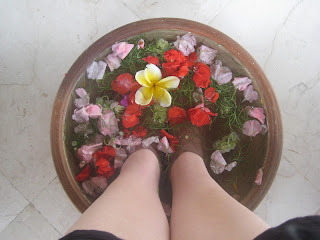 We were warmly greeted by the staff, given flower garlands and asked to take our shoes off so that we could soak our feet in a cooling foot bath. 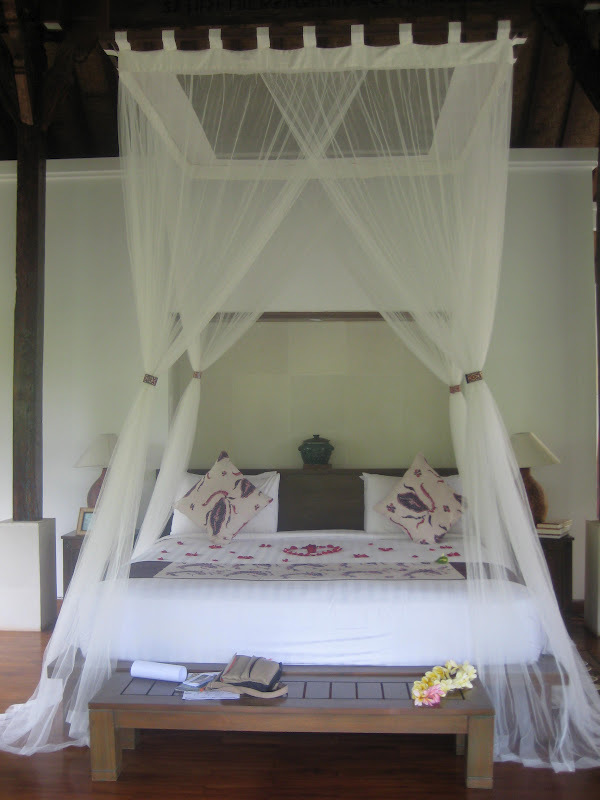 We were then taken to our room, which was more like a villa, with its own private terrace and spa area below. We were amazed at the noise coming from the jungle in front of us and I could only imagine what weird and wonderful things were making the noises. Upon arrival, our feet were immediately plunged into cool water. A cleansing floral foot bath to wash away the dirt of Tokyo! We had breakfast every morning overlooking the pool. 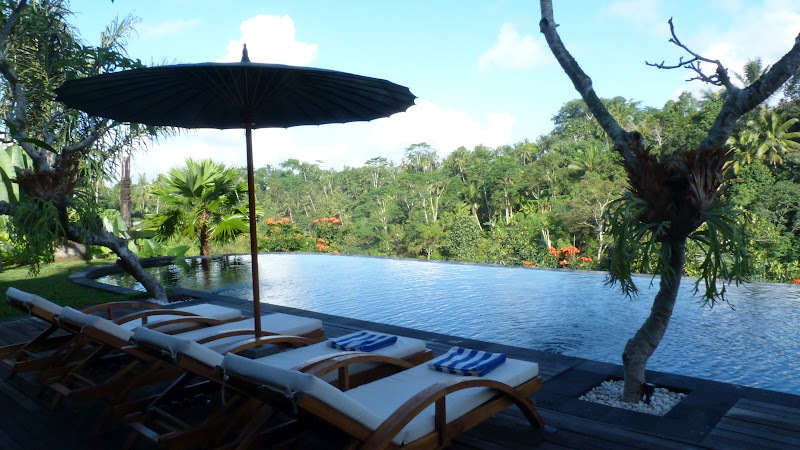 The infinity swimming pool looked over the luscious jungle and to the river valley below. This was our bed. Our view was through the window to the jungle outside. We had our own private spa area under our room. 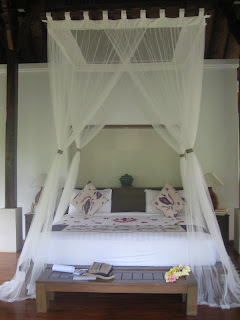 This film footage gives a feel for our view as well as for the weird and wonderful sounds we could hear from our room. First hibiscus of the year!